Use the Traditional Memory Rendering preference panel to change the appearance of the Memory view when displaying memory in traditional mode. 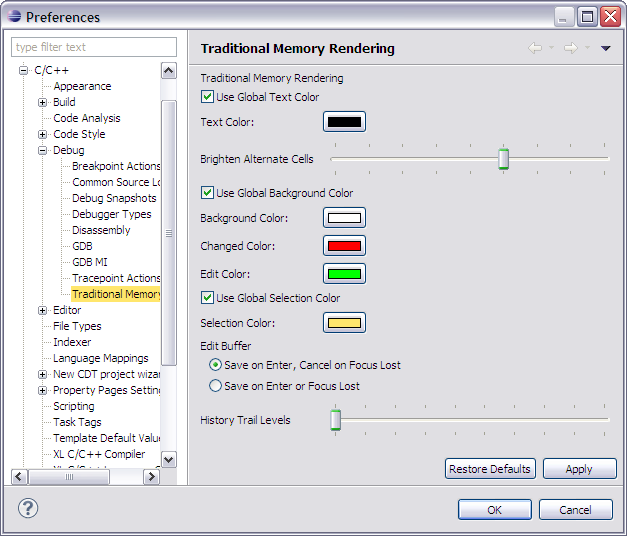 The table below lists the options displayed in the Traditional Memory Rendering Preferences. Use Global Text Color Toggles the use of the global Text Color option. Text Color Changes the color of the text. Brighten Alternate Cells Set the brightness used to highlight alternate cells. Use Global Background Color Toggles the use of the global Background Text Color option. Background Color Changes the background color. Changed Color Set the color used to display changed memory locations. Edit Color Set the color used to show edited memory locations. Selection Color Set the color used to select memory locations. History Trails Levels Set the number of history levels to retain.